There's a Card for That: Floral Thoughts Series | ft. Clearly Besotted "Fresh Flowers"
Floral Thoughts Series | ft. Clearly Besotted "Fresh Flowers"
I'm just going to say that deciding on which floral stamp to use was the hardest part for this card. When I saw Tracey's post I knew exactly what I wanted to do, but then all these beautiful flowers were just staring at me and I seemed to hit a bump. I knew my colour palette, but choosing the flower was another story all together. I tried a few of them (because Clearly Besotted has some of the most amazing floral images - how would I decide?) and went with this one. It reminded me of the soft pink lilacs that used to grow in the front yard of the house I grew up in. To begin, I stamped this floral image from Clearly Besotted's "Fresh Flowers" with Memento Tuxedo Black ink on 110lb Copic-friendly cardstock, then coloured it with Copic markers. I then stamped the same image, using second generation stamping, randomly over my background panel. This was another reason for choosing this image. I liked how full the background looked, yet didn't get overly busy. I mounted the smaller main image on a piece of pale pink cardstock and created a banner to wrap around. Then popped it up on foam tape. I mounted the background panel on another piece of the same pink cardstock and adhered that to the front of my standard A2 sized card base. I added my focus panel, and used clear Wink of Stella over the petals. Unfortunately that doesn't show up very well in the picture, but in real life this is crazy sparkly. I hope you like today's card and are inspired to create something of your own. If you haven't already, please follow me on the right side bar or over on Facebook, so you don't miss out on any future posts. Drop me a line in the comments section below and let me know what you think. 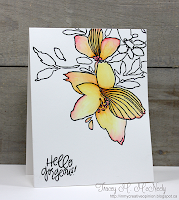 Love how you've incorporated coloured and non-coloured elements on this pretty card, Trina! SO glad you joined us at Muse this week! Lovely card. Love the background panel with the black/white images. Fairy Happy Birthday | Lawn Fawn "Fairy Friends"
Coloured on Kraft | ft. MFT "Our Story"
Growing Up Up Up | ft. MFT's "Up in the Air"